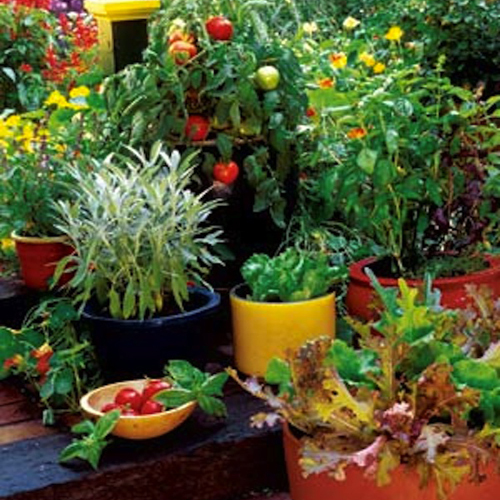 We have talked about container garden tips in the past but we still seem to come up with more that we would like to share. Hope you find some useful here. 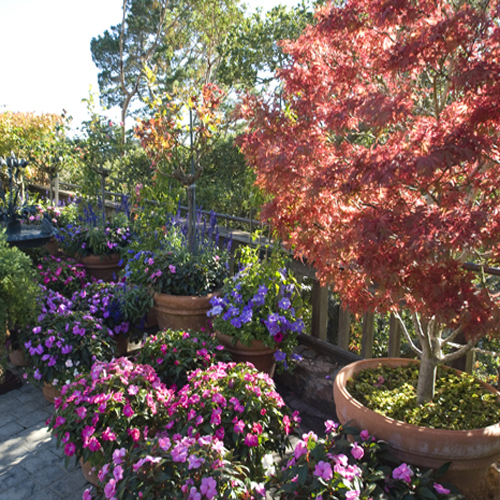 Give potted plants the conditions they need. Assess the site for your contained garden as you would for an in ground planting. Does the area get full sun, filtered shade or deep shade? Choose plants accordingly. Is the area sheltered or exposed to lots of wind? If it's exposed, you will need to install a trellis, windbreak, or other protection before placing your garden planters there. Use foliage plants lavishly. They add structure and form to the area and are a good foil for flower displays. They also create a point of interest in shade, especially when you use glossy leaves to catch the light, or ones with white and yellow markings. Choose containers to match the style of your home. One a Mediterranean terrace you can use terracotta tuscany style pots and use bright colored pottery with glossy finishes in front of a Cape Cod that needs a little boost of something. Don't mix to many pots but stick to a theme. Indoor pots can easily match your decorating style. Shiny, matte, colorful or plain clay - there are so many options to choose from that will blend in an add character to your indoor needs. A. A Hose end nozzle with an off-on lever allows you to turn off the water between containers. B. Long handled watering wands attach to garden hoses to extend your reach. C. Garden coils - self retracting hoses also extend reach and take up little space. D. Drip irrigation delivers water to individual containers and is easy to install with times. Potted plants are magicians. They can turn hardscape into landscape. 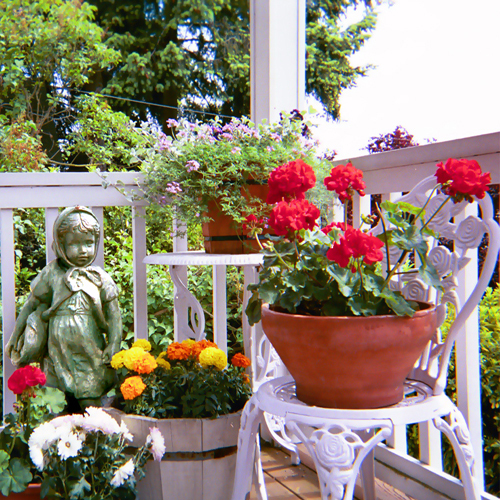 Pots filled with greenery and flowers soften the hard edges or a patio or deck. They also create the feel of a garden where there is no earth to plant one. 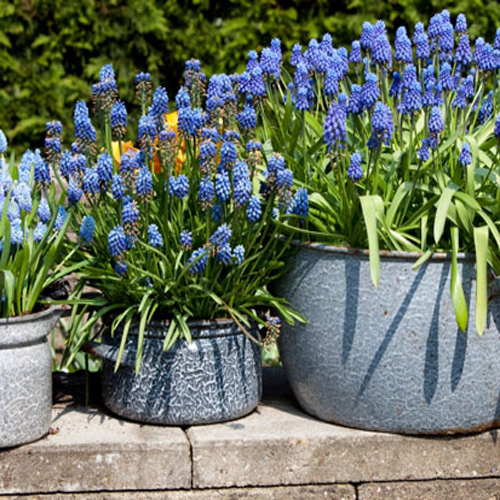 Plants in pots contribute gentle textures, graceful movement, delicious scents, and seasonal changes. They lure butterflies, hummingbirds, and other welcome visitors In short, they can add life to urban outdoor spaces. 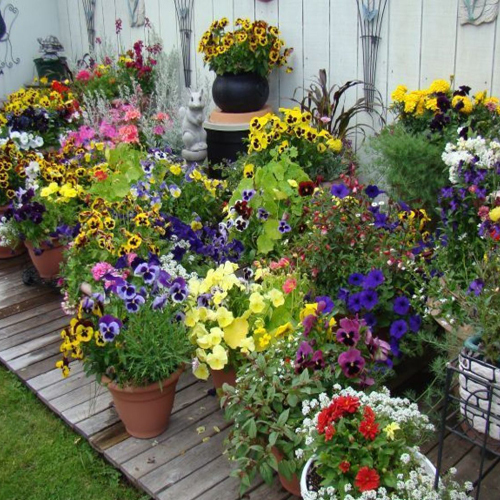 Best of all, because container plantings are portable, you can make little changes at any time without disturbing the whole scene.